For the many of you that suffer from peanut, tree nut, wheat, gluten, soy, egg, dairy, and sesame allergies you can certainly still enjoy your Christmas and make a yummy Gingerbread House to be proud of! 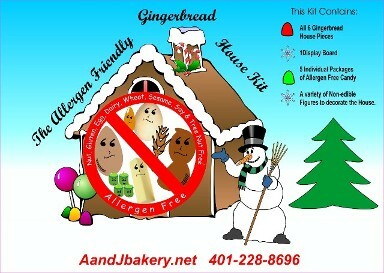 We found The Allergen Friendly Gingerbread House kits from A & J Bakery in Rhode Island. The kits come with a pre-baked Gingerbread House, 5 types of Allergen friendly free candy and a variety of non-edible decorations for your decorating pleasure. A & J Bakery will also include instructions for the construction of the house. The Allergen Friendly Gingerbread House kits are available online or in the bakery store. Cheers!